This provides a grid of cards for currently set up events for the selected projects. 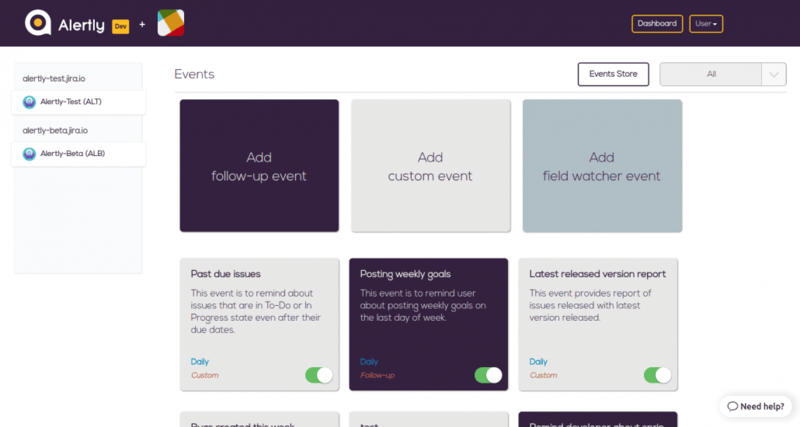 For every project added and users configured, Alertly automatically sets up various events for the user to provide them with easy onboarding. The user can change those events as well as add new events as per requirements. Also, the user can filter events according to types from the filter given on the top right corner. The user can stop the event from triggering at any time by just pressing the switch available on the card at lower right corner. https://alertly.io/wp-content/uploads/2017/11/alertly-purple-beta-logo.png 0 0 Alertly https://alertly.io/wp-content/uploads/2017/11/alertly-purple-beta-logo.png Alertly2017-10-17 05:17:092017-10-17 05:17:09What does Dashboard display? I don’t know how to create events, are there any samples available? Can I change the attachment color in field-watcher events?